All that chat about buildings and construction over the past couple of days made me realise I hadn't been for a bit of a wander around the streets of the City of London for sometime. I thought it might be fun to take you on a tour with me and show you the pictures while I'm away on holiday. 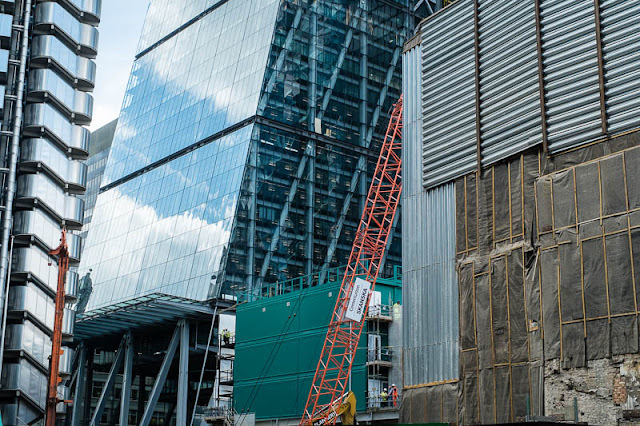 Today's view is the bottom of the Cheese Grater and a construction site alongside. I see a sliver of the Lloyd's of London building to the left. All that glass makes for good reflections! Watch out for falling bolts! I haven't been in London in maybe five years, but I am starting to wonder if I would even recognize large parts of the city.